“RICK DUTROW DONE,” was the search term that led someone to Railbird this morning, presumably seeking more on yesterday’s shocking news that the KHRC denied the trainer a Kentucky license because of his lengthy list of violations and license application inconsistencies. “I never thought I’d see the day when a big-name trainer was held to task for his misdeeds,” tweeted Ryan Goldberg. Regardless of what happens next, there’s no denying, as the Racing Post put it so well, that “controversial trainer Rick Dutrow hit a new career low” on Wednesday. He has a chance to hit another in May, when New York reviews his license, or possibly when his biggest client, IEAH, pulls its stock from his barn. “Obviously, we can’t be in a position where our horses can’t run in certain jurisdictions,” Michael Iavarone told DRF. A restraining order will make it possible for Amen Hallelujah, entered by Dutrow before his hearing, to start in the Vinery Madison today*. He also said any misinformation on his license applications were not intentional but were due to the fact others completed the paperwork for him, and he just signed it. Dutrow said that was because he could not remember whether the incident occurred within the time frame stipulated on the application, but the committee could get copies of his criminal record in order to get the specifics. … also endorsed in principle the recently announced recommendation of the Association of Racing Commissioners International (RCI) to eliminate the use of race-day medications in North American racing and decided to appoint a sub-committee with the objective of developing a plan and a timetable for the elimination of race-day medication in the Breeders’ Cup World Championships. Saying they support efforts to limit race-day medications, two prominent Thoroughbred trainers said they hope the initiatives do not go so far as to ban use of the anti-bleeder drug known as Salix. 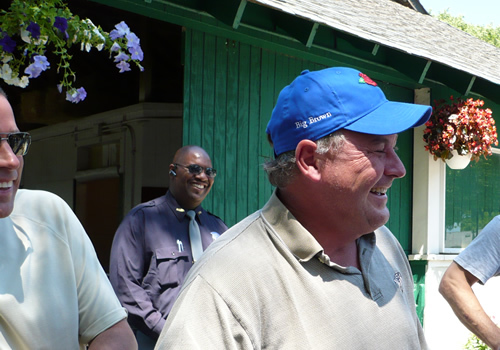 The Kentucky Horsemen’s Benevolent and Protective Association, which represents all licensed owners and trainers, hasn’t discussed stricter medication rules, said president Rick Hiles, a trainer. When a prominent t.v. personality such as Bobby Flay or a successful young businessman like Mike Repole or Kevin Plank — any of whom could participate in any sport they’d like — decides to spend his free time participating in Thoroughbred racing, what do we do? We make it tougher on him by forcing him to continually answer this question: Why do you spend your time in an industry which drugs its athletes? Asking them to answer that question, be it in the lead-up to a major race, or when they’re receiving some other recognition in their professional lives and the topic of racing comes up, is not only unfair, but has to diminish their enjoyment of their participation in racing. Actually, I get this. When I talk to people who don’t know much about racing, the question of drugs often comes up, and I find myself choosing my words carefully and trying to tell the truth but not make it sound so, so bad. There’s a perception of shadiness attached to even the legal medications, regardless of their therapeutic qualities. Banning raceday drugs is about doing right by horses, and giving horseplayers and casual fans reason to trust in the integrity of the game — which is why all the meds, including Lasix, must go. *Turns out, Amen’s start took a last-minute trainer change, an unusual move with implications for trainer responsibility (via @o_crunk). Sallusto was not on the grounds for the [Vinery Madison], leaving jockey John Velazquez as the sole person to answer questions in the wake of the filly’s runner-up effort. “No one,” was Velazquez’s response when asked who gave him pre-race instructions.